In Loaded Launch Event, New Apple TV May Merit Closest Look : All Tech Considered While Apple's new phones and tablet mostly follow the faster-bigger-sharper formula, Apple TV's voice functionality and app ecosystem could be a breakthrough. 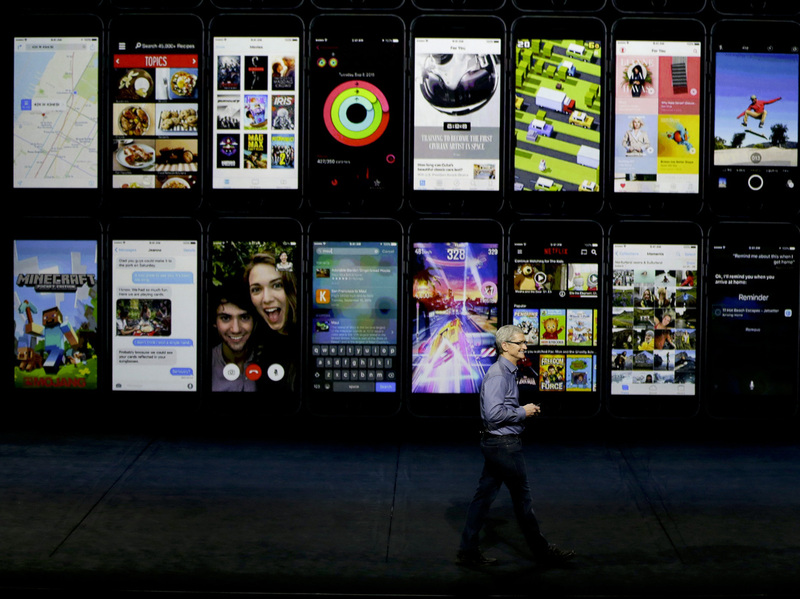 CEO Tim Cook discusses Apple TV during the Apple event in San Francisco on Wednesday. Apple's latest press event wasn't really filled with surprises: Though the rumor mill always has churned before Apple events since the death of Steve Jobs, the rumors have gotten more accurate, so it wasn't a surprise that Apple upgraded its iPhones, iPads and Apple TV. Of the products announced Wednesday, this was the most interesting, and, just maybe, the most revolutionary. 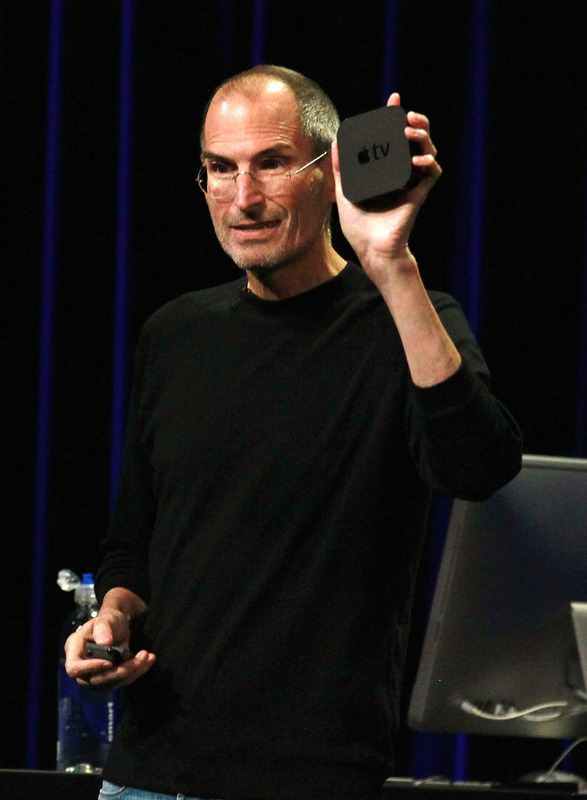 Steve Jobs shows off a second-generation Apple TV during a press event in September 2010. Back when Jobs was alive, he told biographer Walter Isaacson that he wanted to simplify the TV the way he had portable music players and cellphones: "It would be seamlessly synced with all of your devices and with iCloud. ... It will have the simplest user interface you could imagine. I finally cracked it." The new Apple TV appears to be what he envisioned. It's got a lightweight remote that uses voice activation — it's good old Siri — and has a touch pad. For those who struggle to sort out which service has the film or show they want to watch, the new Apple TV has a voice-activated search. For instance, asking for Homeland shows it on Showtime and iTunes for a price. The new remote also doubles as a game controller, so the box is set to be a hub for casual and family games. What could make Apple TV stand out is that it has a new operating system that includes a totally functional App Store. Television 2015: With 25 Ways To Watch TV, Does The House Always Win? 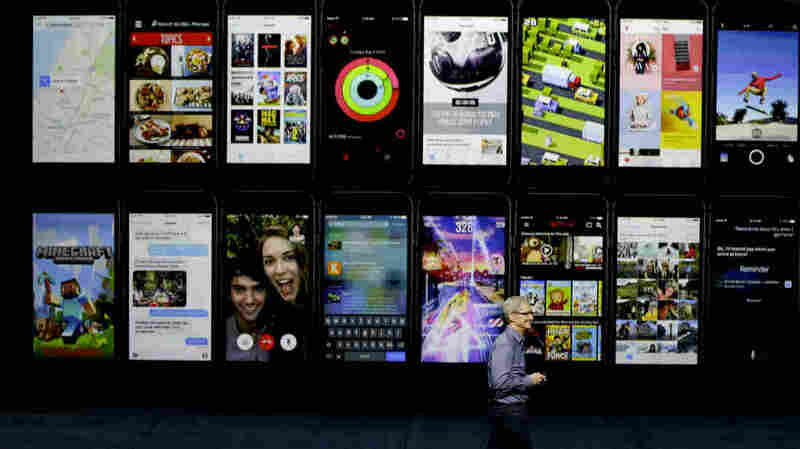 "We believe the future of television is apps," Apple CEO Tim Cook said Wednesday, and he could be right. After all, it is all the apps that have made the iPad and iPhone so interesting. But Apple TV's starting price of $149 is a lot more than the other streaming TV devices, so those app developers better come up with something really good if the upgraded device is going to sell. The first reaction to the made-for-business iPad is that it sure looks a lot like Microsoft's Surface Pro. It's got a lightweight attachable keyboard and ... a stylus. That's something Jobs actively opposed. But he also opposed larger phones, and his successor Tim Cook scored record-setting sales figures with the iPhone 6 by ignoring that advice. Analyst Tim Bajarin of Creative Strategies says he thinks what distinguishes the iPad Pro from the Surface Pro is that the iPad has more power. With an entry level price of $799 it's comparable to the Surface, though you have to pay extra for the keyboard and the stylus, which Apple is calling "the pencil." The iPad Pro will run Microsoft Office, continuing Apple and Microsoft's relationship as frenemies. They're iPhones! And like all the previous upgrades, this one has a better camera, faster processing speed and what Apple says will be an LTE data connection that's up to twice as fast as the previous version. The big change is the new "3D Touch," which means the phone can react to differing degrees of pressure from your fingers. That adds, for instance the ability to tap on an email and glance at it without leaving the message list. If you don't want to keep reading and would rather leave it for later, you can release and be right back to browsing. As someone who has watched Apple for years, it seemed like an awful lot of products for one show. When Jobs returned to Apple in 1997, the first thing he did was cut many of the product lines and focus on the Mac. Cook is clearly expanding the number of products, but it's not yet clear whether Apple can sustain its high standards with so many devices on the market.